I sought out Jackson, who coached Gasol for almost four seasons when the Lakers’ trade for Gasol from Memphis changed the balance of power in the NBA. It was the last great run for the Lakers, who were 50-27 in the playoffs with those two titles and Kobe Bryant and Gasol combining as perhaps the game’s best one/two combination. The Bulls Friday conducted a pair of press conferences to announce the signings of Gasol and European star Nikola Mirotic, the latter a first round draft pick from 2011. Mirotic pursued a buyout from his team in Spain to join the Bulls, but given his lack of NBA experience he will probably be more a developmental player this season. The big coup for the Bulls was the acquisition of Gasol, who was courted by the defending champion Spurs and talented Thunder. The Lakers offered Gasol 50 percent more money to stay in Los Angeles and Jackson made a run at his former center/forward, whom many regarded in that era as the game’s best big man. But the Knicks were limited by a small contract exception offer. The Bulls were able to offer Gasol a contract above the mid-level exception estimated at about $22 million for three years while Mirotic’s deal is said to be for about $17 million for three years. And while Gasol said he believed he could not make a mistake as all the possibilities were attractive, he said the Bulls situation appeared the best to him given the combination of supportive and talented players, a winning franchise history and an excellent chance to win a title immediately. “Money wasn’t the priority here,” said Gasol at his press conference which was separate from Mirotic’s. “I turned down bigger offers; I prioritized being on a championship caliber team. Having been in position where I can hopefully push that team over the top with my game as well. I felt here I will have that opportunity and now it’s just about getting to work. I think we have all the pieces, all the elements to get there. It’s not an easy thing to do, great competition, very tough teams. We have to worry about ourselves and be the best we can be. With that we can make it happen. It’s a process and we’ll see if we can do it. 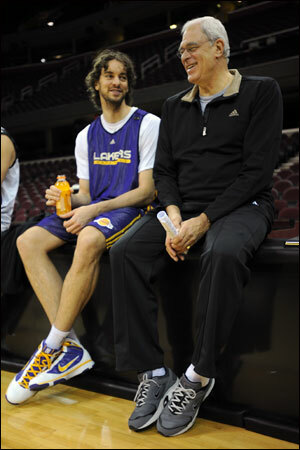 Gasol also singled out managing partner Jerry Reinsdorf for several contacts. Representatives with Gasol said another key factor for Gasol was the Bulls owner reaching out, which was something that didn’t occur with some of the other teams. Gasol gestured a thanks to Reinsdorf during his comments to reporters in the United Center. This is, essentially, the conclusion of what appears to be a very good comeback free agent summer for the Bulls, who were deeply involved in courting the Knicks’ Carmelo Anthony, who, as expected, resigned with New York. Also, rumors persist the Cleveland Cavaliers could be trading for Kevin Love, another supposed Bulls target. If the Cavaliers with the return of LeBron James are able to do so, they would unquestionably be the favorites for the NBA title. But the Bulls with the Gasol acquisition will remain in serious conversation. Gasol’s signing is a major addition, especially given how aggressively even top contenders like San Antonio and Oklahoma City coveted Gasol as well as former teammate, Kobe Bryant and Jackson. Gasol now joins arguably the best front line in the NBA with Defensive Player of the Year Noah and Sixth Man runnerup Taj Gibson. Though Mirotic, a sharp shooting power forward, could get some fill in minutes, Bulls coach Tom Thibodeau, who attended the media conferences with general manager Gar Forman, indicated he’d primarily stay with a three-player front court rotation. “It will sort itself out once we get to camp,” said Thibodeau. “We’ll get a look at the different combinations preseason. Then get set on a rotation and go from there. There’s always injuries as you go along, but I expect Nikola to be a lot better at the end of the season than at the beginning as I do with all young players. What I do like about him is he can shoot. The shooting is something we wanted to address; we added shooting and getting Derrick (Rose) back is a huge piece. How it all fits together we won’t know until we get out there. Getting Derrick back, adding a couple of good young players, the addition of Pau, Nikola, that’s important. You have to have depth. We had it my first two years here; we didn’t have it the last two. Hopefully we’ll regain it. The Bulls are expected to officially announce the signing of Kirk Hinrich early next week as Thibodeau said Hinrich “basically saved us the last two seasons” with Rose out. The Bulls still are in the market for a backup point guard among free agents and remain in the trade market for a shooting guard or minimum salary veteran free agent. But the bulk of the roster essentially is set for next season. Thibodeau, by the way, is in the process of moving downtown as the Bulls next month prepare to open the new training facility across from the United Center. So it seems Thibodeau is locking in for the long haul as well. And why not as the Bulls appear to have pieced together a long term contending team assuming, of course, Rose remains healthy. All appearances now are that he is, which Thibodeau confirmed. Thibodeau added Rose’s appearance trying out for USA Basketball and the World Cup basketball tournament in Spain in September is a positive. Workouts, with Thibodeau an assistant, begin July 28 in Las Vegas and Rose is expected to make the team. “Great,” Thibodeau said about how Rose looks. 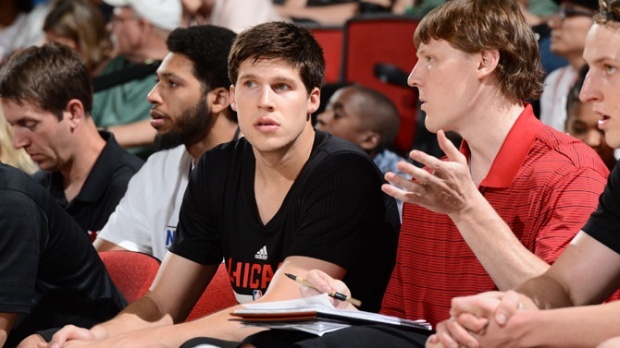 “He went through summer league practices and is progressing well. I think the USA thing will be terrific for him. When you go back to his MVP year, he played with team USA that summer. I thought that prepared him very well for the season. So we’re expecting that to be the same this year; he has not played in a long time. So it’s a good opportunity to get that out of the way. It’s a different role for him with this (USA) team because you are going to have 12 great players. So he won’t have the burden to play a lot of minutes and have to score a lot of points. He can just fit in and run the team; the way he ran the team in 2010 was a big part, I thought, of why they won. That’s all he has to do because there are so many different players who can score there; just fit in. I think it will be great for him. So that’s likely in late August after games in Las Vegas, Chicago and New York City. 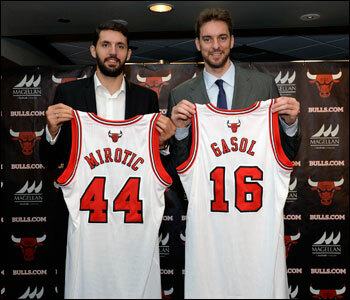 For now it was the start of the Bulls careers of 23-year-old Mirotic from Montenegro and 34-year-old Gasol from Spain. Mirotic will wear No. 44 and Gasol No. 16. Mirotic’s English is a bit shaky now coming to the United States for the first time from playing recently in Spain. He had a translator for many of his answers as he understands better than speaks for now. He failed in several hours at the United Center and later throwing out first pitches at the White Six game with Gasol of being able to wipe the smile off his face. Mirotic was a picture of almost unrestrained joy and enthusiasm as he reaches his NBA dream. “I just want to say my English not so good, but I try to answer (in) English,” Mirotic said in starting out. 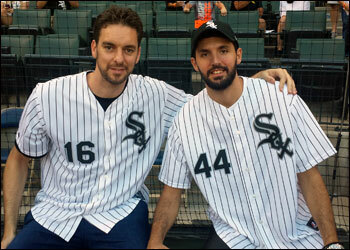 Friday marked the start of the Bulls careers of 34-year-old Gasol from Spain and 23-year-old Mirotic from Montenegro. Gasol will wear No. 16 and Mirotic No. 44. Quipped Thibodeau: “I’ve gone through this once before in Houston with Yao (Ming). Yao seemed to understand when it was praise and he had a hard time when it was criticism. Thibodeau with quips. It was a happy time around the Bulls. “I think Nikola is ready for this,” Thibodeau added. “I think he’ll be a good fit for our team. We’re going to start the process of getting him up to speed right away and we’ll see where we’ll go when we get to training camp. There are a lot of successful international players in our league. I don’t think it will be hard transition for him. There will be things he will have to get used to; it’s a new culture. The NBA is different. But he’s been preparing for this for three years now. At each level you are challenged differently, and he’s responded well at every level. So we expect this not to be any different. The big addition, though, is the seven-foot Gasol with career averages of 18.3 points and 9.2 rebounds with four All-Star appearances. He’s something of a basketball Renaissance man having left a pre-med program in college to enter the NBA draft. His mother was a physician and his father a nurse administrator. Even upon coming to Chicago, he already was setting up opera tickets as it remains one of his passions. He even spoke during his press conference about contacting local hospitals to be involved as he’s previously even sat in on operations when he was in Los Angeles. Gasol likely will start at power forward and then rotate to center to play with Taj Gibson and then a mix and match as the games go on. Gasol is a rare athlete for a seven footer with a good shooting touch and clever game. So he’s occasionally been condemned in NBA vernacular as “soft,” which Jackson disputes. And Gasol has a history of playing big in big games. In helping turn around the Lakers 2007-08 season, Gasol had 36 points, 16 rebounds, eight assists and three blocks in the opening playoff game. He had 17 points and 13 rebounds in the semifinals clincher. He had 19 rebounds when the Lakers closed out the Spurs to advance to the 2008 Finals. His last second putback saved the first round series in 2010 against the Thunder. In Game 7 of the 2010 Finals, he had 19 points and 18 rebounds for the championship. And now Gasol says he chose the Bulls as his best chance to return to those Finals. Pau on Chicago: “My wardrobe will have to change. I’ll look forward to where I can get the biggest coats.